U.S.-based online merchants and couriers have been pushing hard for an increase in the de minimis level, below which courier or postal shipments into Canada are exempt from sales taxes and customs duties. 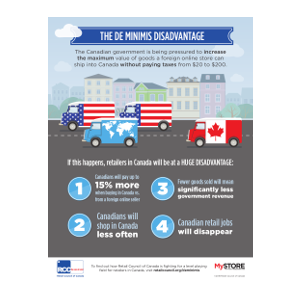 Changes to the de minimis level could be devastating to retailer merchants in Canada and to our 2 million+ employees. Under Canada’s Postal Imports Remission Order and the Courier Imports Remission Order, the de minimis level is currently set at $20 Canadian. The term de minimis is derived from a legal maxim: de minimis non curat lex (the law does not concern itself with trivial things). In this context, de minimis regimes are supposed to provide streamlined border clearance. The rationale is that the administrative burden and processing cost does not justify collecting taxes or duties on very small individual shipments, which (below $20) would typically yield amounts below $3 each in tax and duty. It is also expected that these purchases will face shipping and handling costs that could exceed the savings in tax and duty, so there is not a big incentive to online shop cross-border at the sub-$20 price level. The U.S. online merchant and courier lobby is pushing to raise that threshold from $20 to $200. That would mean that any item costing under $200 could be shipped into Canada free of federal and provincial sales taxes and also duty-free. Meanwhile, merchants in Canada (whether in-store or online) would be required to collect sales taxes on the same or competing items sold to customers in Canada and to pay duties on imported goods. On sales taxes alone, the U.S. merchants would have a tax advantage over merchants in Canada ranging from 5% in Alberta to 15% in Atlantic Canada. The average price advantage that this would give to US online merchants would be 12.3%. And that’s apart from their additional advantage of being able to avoid any customs duties that merchants in Canada are required to pay on imported goods. de minimis at anything like the $200 -level would lead to massive increases in cross-border orders, with the obvious negative consequences for retailers in Canada and their employees. Even a seemingly small increase could have a major impact, especially because, as the threshold level rises, U.S. online merchants could start to offer free shipping to Canada as many of them do for their customers in the United States. The investments being made by retailers in Canada in establishing our online offerings could be in jeopardy, impacting also upon some high wage jobs in IT, logistics and distribution for example. Internal allocation of capital could become an issue for U.S. and international firms operating in Canada, as it would be more difficult to persuade headquarters of the need to invest in Canadian online offerings or even of bricks and mortar where customers could just as easily be serviced online from outside Canada. The tax and duties forgone by Canadian governments, including provincial governments, would be substantial. Isn’t De Minimis higher in the US? The United States has long had a far higher de minimis rate than Canada. It was at the $200 USD level until March 2016, when it was raised to $800 USD. But there is no comparison between Canada and the U.S. First, the United States does not have a federal sales tax, so there is no tax advantage created for inbound shipments. The U.S. also does not collect state and local sales taxes at the border or for interstate shipments, so the playing field is far more level between inbound and local sales. Second, the United States utterly dominates its own online retail space, with only 22% of U.S. customers reporting having made a purchase from a non-U.S. seller. By contrast, 67% of Canadians report having made online cross-border purchases. The scale of U.S. warehouse operations is such that the U.S. can easily afford to offer a high de minimis level, while pushing other countries to raise their own levels. Despite a strong push by U.S. trade negotiators, U.S. warehouse sellers failed to obtain a $200 threshold during negotiation of the Trans-Pacific Partnership (TPP) agreement. Undeterred, they then targeted the Canadian federal budget process, hoping to persuade the Government to make a change in the 2016 Budget. Now that that too has been averted, they are actively lobbying federal Ministers and MPs, many of whom report being pressured on this issue in encounters with U.S. Senators, Congressmen and officials. It is a very well-funded and well-organized lobby and it is clear that they intend to continue to push the issue. Retail Council of Canada has worked hard to educate Canadian officials about the potential consequences but we think it is time that Canada’s retail merchants make our views known directly to our elected representatives. RCC does not understand why the Government would ever want to confer a tax and duty advantage on a U.S. warehouse seller, who employs few if any people in Canada, at the cost of a Canadian employer who creates jobs and economic activity here, whether in bricks-and-mortar stores or online. The consequences for investment and employment could be catastrophic and given that retail employs one-in-eight Canadians, the Canadian economy overall would suffer. Government revenues would be sharply reduced, both by the foregone sales taxes and by the economic impact.